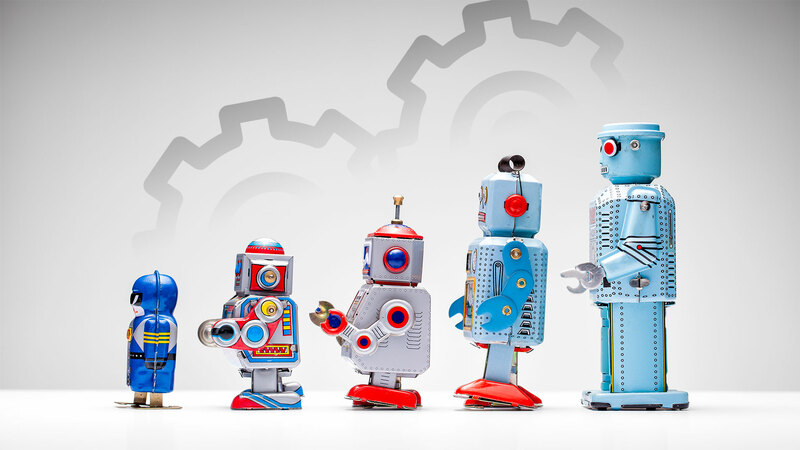 More and more organizations are experiencing the benefit of Robotic Process Automation (RPA), not only for the back office but also for the front office processes. In recent years no fewer than 6 million digital employees have been “born”. Adding Artificial Intelligence (AI) to RPA results in an increase in efficiency and ROI. We call this combined technology Intelligent Automation (IA). What exactly is this technology, what are the advantages and why should you use it? In the drive to optimize business processes, more and more organizations are focusing on Robotic Process Automation. RPA is an emerging technology that has boomed in the last three years. RPA is a software application that, in short, replicates repetitive data entry work performed by employees, such as inputting purchase invoices in a SAP-system. RPA can easily be implemented “on top of” heterogeneous environments like standard or custom (legacy) applications, web pages, office products, etc. To illustrate, the following RPA process flow shows the processing of meter cards from customers by an energy provider. Why should I use RPA for my organization? Return on Investment RPA can quickly reduce> 20% of process costs, while investments are relatively low. Within a few weeks, a proof-of-value can be realized. A production implementation can be realized within a few months. Given this potential, it is hardly surprising that the use of RPA by organizations has increased significantly. Research firm Gartner reports a turnover increase of an average of 57% per year. This is expected to continue and eventually reach $ 2.4 billion by 2022. More and more software vendors are entering the market, sometimes in very specialized business domains (“verticals”). According to a recent Forrester survey, the current all-around top players in RPA software are: UIpath, Automation Anywhere and Blue Prism. RPA as a stand-alone configuration is non-intelligent. It cannot learn from experience and improve itself. Every change in input, processing steps and output requires human action. Using RPA has the best return when optimizing less complex, high-volume business processes. It is sometimes stated that to be approachable, a use case must comply with the so-called “three fives”: fewer than 5 decisions, fewer than 5 clicks, and fewer than 5 applications. The savings through RPA decrease as the business processes become more complex. While RPA minimizes human actions in business processes, AI minimizes the necessary human thinking power. AI is mainly data-driven, whereas RPA is more process-driven. AI adds cognitive intelligence to RPA. Typical AI capabilities tasks include: document classification, text (and image) analysis, speech recognition, risk analysis, affinity analysis, sentiment analysis, intent classification, data extraction from text, analysis and prediction of (customer) behavior, clustering of (customer) profiles, predicting supply and demand. 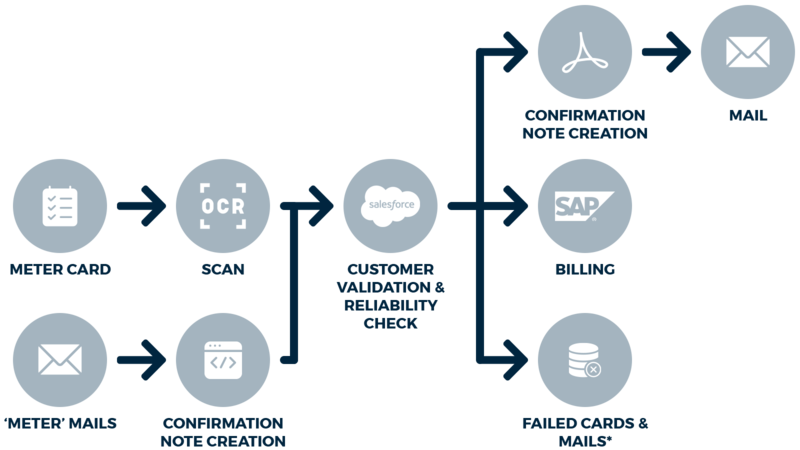 These capabilities are made possible by a combination of software tools and providers. They consist of programming languages (ex: R and Python), libraries (ex: Scikit Learn for Python)) and frameworks (such as Tensorlfow, Microsoft Cognitive Toolkit, Amazon Machine Learning). The use of this spectrum of tools, however, requires more in-depth knowledge of data scientists and IT experts. The combination of RPA with AI is called Intelligent Automation (IA). IA, as it were, increases the understanding, reasoning, problem-solving, learning, and interaction abilities of the IA bot, or more accurately the digital agent. This potentially enables a higher degree of so-called Straight Through Processing (STP) and in effect futher optimization of business processes. Below are some examples from my daily practice as a consultant in this area. It concerns use cases in which RPA and AI have been applied in combination with each other. Processing of meter readings by an energy provider: data about meter readings are extracted from incoming “unstructured: emails using AI technology. Then the meter readings are recorded in the back-office system. IA enables organizations to bring the cost savings of the back-office process to the benefit of the front-office process and customer satisfaction. In addition, greater flexibility and agility can be achieved for larger organizations with Global Business Service centers. Finally, IA can contribute to larger employee satisfaction, because the boring repetitive administration work and administrative burden are taken over by the digital colleague. Especially of value in the current time of resource scarcity. The short implementation time from idea to actual “go-live”. The above makes Intelligent Automation not only reachable for the higher business segment but also for SMEs. The best approach to start with Intelligent Automation is to look for a small use case with quick wins. This is to actually experience the costs, benefits, possibilities and limitations. We are happy to help you with this through the knowledge and experiences in our AI center.